Gee I wonder who designed this invite for enchanted scrapbooking..............ME! !I won the birthday comp to design an invite ( OK I was the only entry so it was a win by default but I like it anyway :D) So make sure you come over and check it all out! 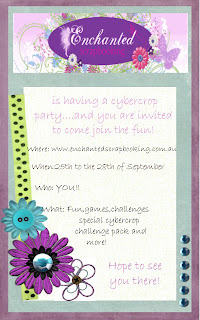 Hope you all have a good day and dont forget to check out the cybercrop at scrapboutique tonight!! omg that birdie card is the best krissy!! i love it!!! Wow your scrapping whispers LO looks so gorgeous! The flowers are just beautiful! Love those cards too, and great job with the invite! What a shame, but you can't spread yourself too thin. You deserved to win the invite comp- it was fabulous - you just scared off any opposition!! LOVE LOVE LOVE all those creations, very inspiring and those flowers you make just ROCK!! Have a great time scrapping!